Fleer Trading Cards wants to take fans behind the scenes and bring them closer than ever to their favorite Idols with the inaugural release of American Idol® Season 3 Trading Cards. Idol enthusiasts will not only be privy to exclusive backstage photography of America's favorite television show but will see the contestants sing their way from their audition stage right through to their place in the final 12 through agreements with FremantleMedia, 19 TV and FOX television. "Working with FremantleMedia, 19 TV and FOX, we were able to gain access to exclusive behind the scenes photography and utilize their on-air footage," said Fleer spokesman Joshua Perlman. "With this product, we want each of the millions and millions of American Idol fans to feel like they are there with the contestants." To ensure that "being there" feeling, Fleer has acquired actual wardrobe items worn on the show from each of the 12 finalists for use in the set. There's a tank top worn by Hawaiian hopeful Jasmine Trias, a dress shirt donned by the soulful George Huff and also an infamous pink dress worn by Jennifer Hudson that received less than enthusiastic marks from the judges. Much like the contestants themselves, the items will go through several rounds of cuts until 1" x 1" swatches of fabric are left to be embedded into uniquely collectible trading cards. The trading card set also features perhaps the very first autographs scrawled by the finalists since they realized their newfound stardom. Each Signed, Sealed and Delivered card features the John Hancock of John Stevens and Jon Peter Lewis, along with the likes of Fantasia Barrino, Diana DeGarmo and all the rest of the dazzling dozen. Even host Ryan Seacrest and judge Randy Jackson got in on the act and lent their signatures to the set. One would guess that the odds of obtaining one of these autographed or event-worn wardrobe cards would be longer than becoming the American Idol®. However, Fleer has ensured that these very special cards get into the hands of Idol fans by delivering them at a rate of 1 in 18 packs - or two per 36-count box. "We wanted to make sure that these cards make it into the hands of the fans of the show," said Perlman. "The ability to have a piece of your favorite idol for the pack of a price of trading cards is a concept we feel will be warmly received." 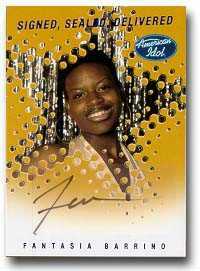 The American Idol® trading card set will release on April 26, 2004 with an SRP of $1.99 per pack. Each pack contains five trading cards. The complete set includes: 38 Contestants Cards, 3 Talent Cards, 6 Rejected! Cards, 32 The Auditions Cards and ten (10) On Location Cards. There are also randomly inserted chase cards including: 15 Behind the Scenes Cards and 32 Idol Chatter cards as well as the autographed and event-worn wardrobe cards. For die-hard fans of the show, Fleer even made sure to include cards of cult favorites such as Nicole "Scooter Girl" Tieri and the one and only William Hung. "This set totally encapsulates Season 3 of American Idol®," said Perlman. "All of the personalities that America has come to know and love are there and presented in ways never seen before."